A large crowd of supporters flocked to the CIFA complex to witness the football action. In the first spell of the match Sokattak and Tupapa had goal scoring opportunities but failed to make them count and seeing their shots going wide of the goal. Sokattak almost landed their first goal in the thirty fifth minute when a foul was committed in the eighteen yard area however the ball was seen flying high above the goal. Both teams mounted a lot of pressure on their opposition’s defense, looking for that gap but did not succeed with the score still nil all at half time. Both teams regrouped at half time, coming in with determination to score and win. Sokattak finally broke through Tupapa’s defense when a throw in by Kunda Tom and finding unmarked Jonathon Rowe to nod the ball past Tupapa’s goalkeeper to give Sokattak their one goal victory over Tupapa. Sokattak Captain Romeo Keu was over the moon with the result. 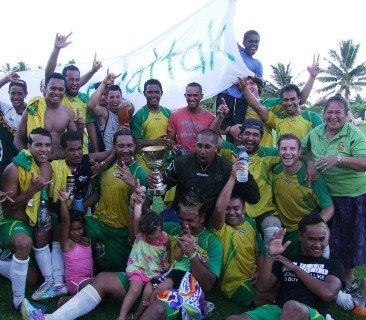 “I and my team are happy with our win”, says Sokattak captain Romeo Keu. “We always have a great game against Tupapa but today we needed this win and we have it”, he says. Tupapa losing the final match and only game throughout the 2001 football season. That clash was obviously the highlight of the day but the earlier match in the senior women’s division Tupapa winning over Arorangi by one goal to nil when a free kick taken by Liz Harmon caught the Aorangi goal keeper off guard and seeing the ball flying over her head for Tupapa sole goal and win. Both teams were evenly matched in most facets of play throughout the game but Tupapa was delighted to end the season by winning the round cup and knock-out competition for the second time. In the Under 17 Men’s game round cup winners looked to be favorites heading into the match against Matavera. Matavera got on the score board first through David Piakura in the first half however Sokattak’s Irangi Mauri headed through a corner kick to level the score at half time. The second spell of the game saw Matavera lead again with their goal slotted through by Anthony Samuel after a foul was committed in the eighteen yard area. Sokattak did not give up and leveled the score at two goals each at full time and heading into a penalty shootout to determine the winner. Matavera winning the shoot-out by four goals to three. Tupapa won the under 14 girls division by three goals to nil over Avatiu while Nikao Sokattak defeated Tupapa in a penalty shoot-out in the under 14 boy’s category. The Cook Islands Football Association’s staff and executive members would like to wish everyone a Happy Christmas and Merry New Year.